I let him tow me upstairs as I self consciously stroked the stringy strands left on my head. Once we reached the upstairs bedroom he pulled my hand away. "Hey, it'll be ok. We'll fix it. Don't be self conscious around me." "Caleb owns his own company." He looked surprised at that, as I knew he would. "He runs a tutoring service for kids that are struggling in school." "Well, I can't really make fun of him for that now can I?" He pulled my face up with his hand cupping my cheek and kissed me on my trembling mouth. He smoothed his hands down my arms, my back, my hair, my cheek, soothing me. "There's a picture of you two in the dictionary under 'get a room'," Kyle said from behind me. Destiny is a meddlesome wench, isn't she? When I finished Significance, I was dying to pick up this book. I was in love with the characters, their story, and--most of all--their romance. I wanted MOAR. So I jumped into this one and was thrust into the same sweetness the first book was coated in. Honestly, these books are so sweet I think they're starting to rot my teeth. Still, I regret nothing. Caleb and Maggie are dealing with their ascension, the Watsons, and other issues and advancements that arise. We get pushed more into what being an Ace IS and what it MEANS in this book. I thought it was interesting, though I truly stick around for the love. But Maggie is learning more about everything, thus becoming more confident in not only her relationship with Caleb, but with herself as an Ace. It was cool to watch that growth bloom even more from where it'd been at the end of the first book. There's still more to come, but I liked. Caleb's continues to be the sweetest, most patient, and understanding guy ever. He's happy for Maggie and her ascension. He helps her through the pile of crap they have to sort through--and keeps adding up. He has maybe one or two moments where I want to tell him to take a chill pill, but other than that he possesses my heart. Their relationship still sets my heart aflutter. My favorite part of these books is the romance, and this one definitely delivered on that. I love how Caleb and Maggie's relationship is the sweetest thing. (Are you tired of me using the word "sweet" yet? It's the PERFECT word for this series, though!) They are attracted to each other, of course, but we don't get submerged in LUST LUST LUST. We get cute moments. We get to see them chat and be adorable. We see them grow together and learn more about each other as they realize how freaking amazing imprinting is for bringing them together. Sure, they have some bumps along the way, but at the end of the day these two are such a strong couple and I love them so hard. The plot of this one incorporates more than the first book did--though the first book clearly set some of these things up to happen. We have more with Bish and Jen, and we have things happening with Kyle. Personally, I'm here for Caleb and Maggie, so I wasn't too invested in these aspects, but I did enjoy reading them. They didn't bore me, and it did add some to the sweetness (though Caleb and Maggie will always be the winners there). (At least for these first four books. I have no idea if Seth and Ava will win the sweetness crown. We shall see!) While the plot was more involved this time around, it was like the first book in that I was glued from beginning to end. I enjoyed the storytelling. 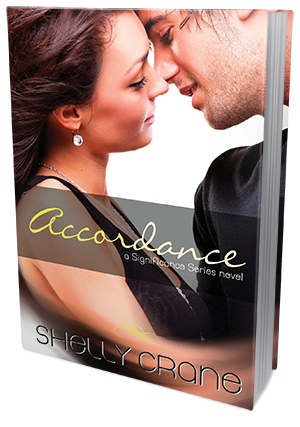 Overall, Accordance was a great second installment to one of my all-time favorite series! I loved getting more Caleb & Maggie--and their sweetness. I enjoy their story, I enjoy their romance, and I can't wait for more!